Rating: **** All inclusive hotels are growing in popularity thanks to the incomparable advantages they offer. Breakfast, lunch, dinner, snacks, drinks, a wide range of sports, baby or mini clubs, and so much more including in the price you pay! Ideally located on the island of Cozumel, the Melia Cozumel Golf & Beach Resort is truly one of the most impressive all-inclusive hideaways in all of Mexico. Featuring an array of amenities, facilities and unlimited amounts of fun, this beautiful beachfront resort is directly across the street from the island's premier golf course designed by the Nicklaus Design Group and just three miles from San Miguel, Cozumel's main shopping area. The perfect place to enjoy the crystal clear waters of the Caribbean Sea and the white-sand beaches for which Cozumel is known; Melia Cozumel offers a casual, comfortable and inviting resort experience that is certain to satisfy one and all. The Flintstones have found the perfect place for the vacation! They will be enjoying at one of our first theme hotels. Look out for them at the Yabba-Dabba-Doo Bazaar as well as in the gardens and at the swimming pools. 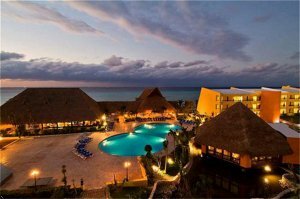 The Melia Cozumel Hotel is situated on Km 5.8 of the carretera Costera Norte. Exiting the Airport take Avenida Aeropuerto until reaching the store Sedena on the Costera and turn right. The Hotel is located in this avenue right in front of the Country Club. You'll know you're in the Caribbean when you enjoy your breakfast buffet at La Isla restaurant. The tables are set up on a wooden deck and are covered by a thatched roof. It's a popular place to sit and stare out at the white sand and palm trees that lead to the light blue waters of the ocean. At night, La Isla restaurant and the palm trees on the beach are all carefully lit to create a fun and romantic ambience. For a more upscale dining experience, cross the small bridge to Cafe Paraiso restaurant & piano bar, which is situated in a tiny lagoon within the resort. Also try La Iguana Grill for a snack, or any of the 5 bars located on the beach, next to the pool, the nightclub, lobby bar or Cafe Paraiso. It is located close to the beach, serving an extensive tropical-Caribbean breakfast, lunch and dinner buffet. It is situated in a tiny lagoon within the resort, serves a daily changing a la carte dinner accompanied by an excellent wine selection; piano music and a colorful fish tank give the restaurant an atmosphere of cool elegance; dress code applies, reservations required. A la Carte grill dinner, specializes in international dishes grilled a la minute! Seasonal, please check at the resort. That is our open-air snack bar open during the day, offering a refreshing selection of hot and cold sandwiches by the poolside and on the beach. 5 bars offering fashionable cocktails and selected international brand drinks: our lobby bar featuring live bands, a swim up bar, a beach bar under a giant Mexican Palapa, our Club Fantasia theater show bar and Cafe Paraiso. Archeological Mayan site which shows ruins from a city which was the adoration center of the Goddess Ixchel. Architecture from the classic and postclassic period. The museum shows the wild flora, fauna, and submarine life. Pieces from the Mayan culture, the Spanish conquest and the life of Cozumel from the 40`s until our days. Ecoturistic Park, promotes the wild flora and fauna conservation. It also has a navigation museum, swimming and snorkeling areas. Here nature shows its diversity of various mangrove, swamps, a logoon, birds, and reptiles. kayak adventures. Melia Cozumel Beach & Golf Resort has a very fun and social atmosphere. Many of our guests enjoy meeting each other on the beach volleyball court, or perhaps over a game of water polo in the swimming pool. Join our activities team for aquerobics, cooking lessons, or even Latin dance lessons! Choose from several water sports including windsurfing, kayaking and snorkeling right off the beach, or horseback riding and excursions (additional charges apply). Or just relax with a nice cold pina colada from El Isleno, the swim up bar in the pool or enjoy our Spa with an array of body treatments including therapeutic massage, facials, manicures and pedicures (additional charges apply). Flintstones Land with special activities for children up to 12 years of age. Located in front of the hotel is the Cozumel Country Club featuring and 18-hole, par 72, championship golf course designed by the Nicklaus Design Group. In the evening, don't miss the red and orange Caribbean sunset while listening to live music in our lobby bar. Then be sure to catch the famous shows performed nightly in our theater by local talent and our entertainment staff. Afterward, dance the night away by the beach and under the stars! What are you waiting for? Book your room now! Sit back and enjoy a great selection of drinks & cocktails while enjoying one our famous shows performed by local talent and our animation team, after show ends, dance at the rhythms of the new century until late at night. * Fantasia NightClub and Theater with capacity for up to 100 people, available for use as a meeting room from 7am to 7pm. * Audio-visual equipment * Over-head projector adaptable for computers, flip charts, VCR or DVD player, a wide projection screen, sound equipment including a wireless microphone and Karaoke by request.